Medevac's usually all follow a similar script: A nurse calls from a community health centre for advice about an ill patient they are seeing. The doctor taking the call then decides if an evacuation is required, and if a doctor needs to go on the flight. The flight crew then get the plane ready and fly out. Scripts are good, they help organize otherwise chaotic situations. This past weekend I had a medevac that was a little off script. A call came in about a man who was, for some reason, out in the wilderness, about 200km from any settlement. He was in poor radio contact, but apparently said he needed an evacuation. 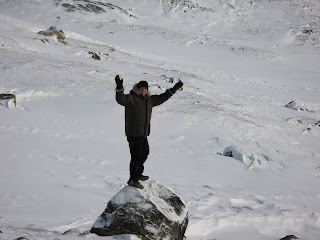 He gave some GPS coordinates, and that was all. It was decided that the regular air ambulance could likely not land at his location, so a helicopter was arranged. It seemed to be part search and rescue, and part medevac, but as the information available was so limited the decision was made to send a doctor with the flight, and the next thing I knew I was getting ready to fly. Since the helicopter had no medical supplies, I tried to gather up what I might need from the hospital, meds, IV supplies, etc, and packed them into my duffel bag. I also grabbed 2 units of O negative blood, thinking that having blood on an unknown call is always better than not having it. 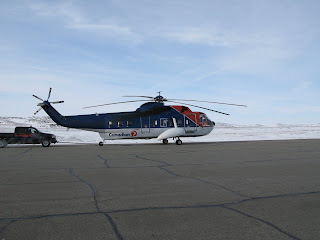 The helicopter used for the foray was a Sikorsky S-92. 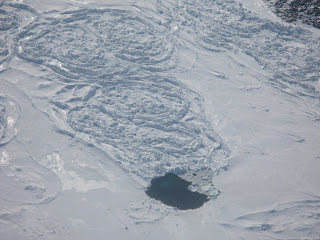 Flying in a helicopter is a great experience, you get to fly much lower than in a plane and the views are great. I snapped a few pictures of the scenery on the way out. 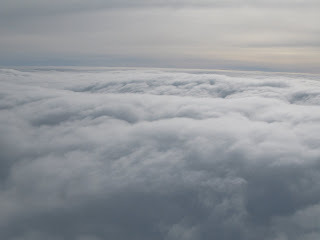 As we neared the GPS coordinates we got into thick clouds and had to climb above them. The pilots circled for about 20 minutes looking for a way down to land, but there was not a break in the clouds to be found, and a blind descent into unknown terrain was far too dangerous. 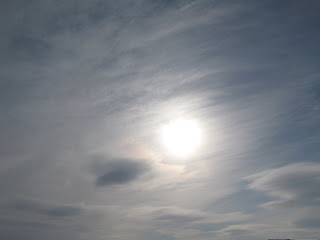 Here is a shot of the clouds over top of our target. 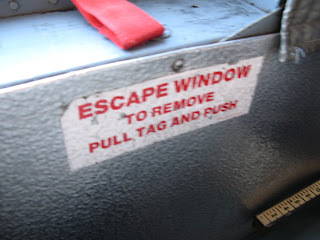 The idea of going down through them was enough to make you review the evacuation procedures! 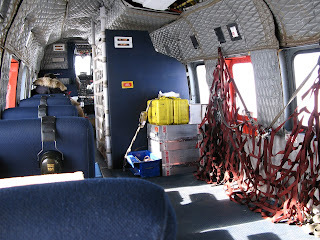 In all medevacs, safety is the top priority, and so with no safe way to land we were forced to turn for home. 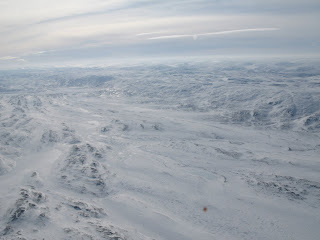 As we returned to Iqaluit the weather cleared again for our final touch down. In a city you forget how silence sounds. The background of cars, and horns, and people fade, you ignore them, but they're always there. Even on the quietest night in Vancouver, you hear the occasional woosh of a car up the street. There is always something going on, and with it, noise. Most people have had the experience of being somewhere quiet. Growing up in Ontario, silence had something to do with the sound of camping on a lake at night. The occasional loon call, a few crickets, and the leaves moving in the trees, the only things audible in the darkness. 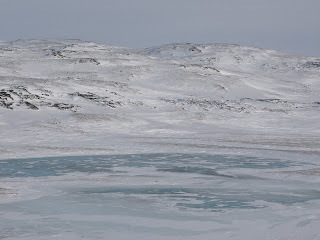 Iqaluit is quiet, although if you pay attention you can still hear the hum of things. There are cars, and people, and often wind. 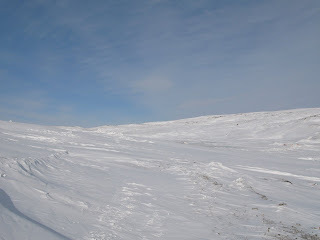 When Julia and I were out of Iqaluit on our walk last weekend there was no wind and no snow, no cars or people, no crickets, or loons, and of course no trees. We stopped for a moment for some reason, and when the sound of us walking stopped, there was nothing else. Silence. It was still and clear, you could hear forever in the distance but there was nothing to make any sound. 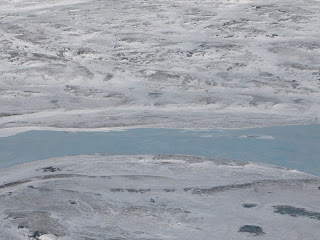 The silence was a part of the landscape, vast and real, and very peaceful. 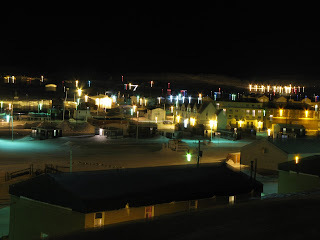 Here is a picture of Iqaluit lit up at night. There is a very interesting article in the Globe and Mail this morning titled B.C. likened to U.S. after refusal to pay for costly treatment . The article is about the availability of the the drug Hepsera for the treatment of chronic hepatitis B. This is a treatment that has huge potential costs for the already strained health care system. Like the debate about the provision of the drug Fabrazyme for Fabray's disease this is really part of the debate about where we put our health care dollars. In my opinion it is vitally important that we recognize that health care is a finite resource, and that appropriate resource allocation is the key to ongoing provision of publicly available health care in Canada. I'm not arguing against Hepsera (which could actually be cost saving, as hepatocellular carcinoma, and cirrhosis are expensive consequences of chronic hepatitis B), rather I am arguing for rational, and evidenced based allocation of health care resources with input from front-line health care providers but not macro allocation by front-line health care providers. I've pasted my response to the article, as posted on the G&M website below. This is part of a larger and more interesting question in our health care system. Where should resource allocation take place? In the current Canadian health care system patient autonomy is held as near absolute, and many, perhaps most, Canadians feel that they are entitled to any treatment that is of potential benefit, regardless of cost. This is an issue when we look at treatments that are only occasionally required, but extremely expensive (for example Fabrazyme, for Fabry's disease) or for cheap but very widely used treatments (like statins for hypercholesterolemia). In BC there is a hidden epidemic of chronic hepatitis B. 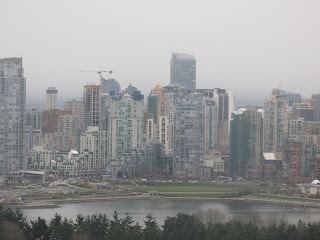 In part due to a history of immigration from areas of south east Asia where Hep B is endemic, there are estimated to be about 40,000 people in the BC lower mainland with chronic hepatitis B. All of these people are at risk for hepatocellular carcinoma (liver cancer) and cirrhosis. Currently no organized program exists to provide all these patients with follow-up (regular ultrasounds, and alpha-fetoprotien measurements), never mind to treat all of them. The issue here is the cost of the potential 40,000 people who would benefit from treatment. The question is complex, because we must recognize that as a resource, health care, in the broadest sense, is finite. Spending money on any treatment means not spending money on another treatment. More money for one disease means less for another disease, or for public health programs, or for early childhood nutrition programs, or for something else. As a doctor, I recognize that I may not be the best person to make decisions of resource allocation. I am generally focused on the patient in front of me, and charged to act as their advocate. I will almost always recommend what is best for them personally first and for society second. That being said, I recognize the vital importance of thoughtful, evidenced based resource allocation. In our strained system, where that occurs is a vital debate. 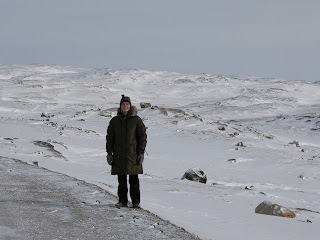 This past week Dr. H. made it up for a visit to Iqaluit. since we are considering coming up here longer term, the hospital was nice enough to arrange for her to travel up for a site visit. It was a long trip for her including an overnight flight from Vancouver to Toronto, before heading on to Iqaluit. She arrived last Friday, and was greeted with beautiful sunny and -30 weather! We started off with a tour of the new hospital, which is set to open some time this summer. It is a beautiful facility and will be a big step forward once it is finally complete! On Friday night we went out to dinner with a bunch of the other local doctors. It was a load of fun, and Julia got to try caribou (which is delicious). One of the best things about going to dinner in Iqaluit is that while you are there a lot of the local artists bring by their carvings to see if you want to buy them. We saw a couple of large inuksuks that were great, and a hunter that was really amazing (one of the other docs bought it). It was a fun dinner and I think Julia got a bit of an idea of how nice the current group of people up here is to work with. On Saturday we went walking about town. 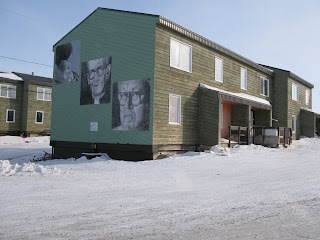 we went to the visitors centre, the library, and then to the museum, where a new art exhibit about a traditional legend called Kiviuq was opening. On Saturday night we went to a premier of a locally made movie about the Kiviuq legend. It was fascinating! The legend is difficult to explain, but basically is a story of a young man that serves as a parable for life. 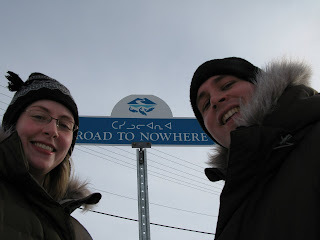 On Sunday we wen on a long walk out the Road to Nowhere. an aptly named track that stretches a good way out into the countryside. 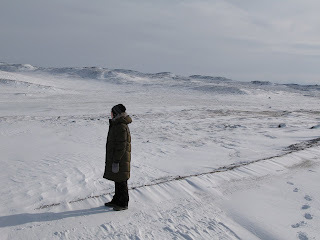 It is really neat walking in a land of rock and ice, and it was really hard to judge perspective, distance, and size of the hills and rocks in the distance. 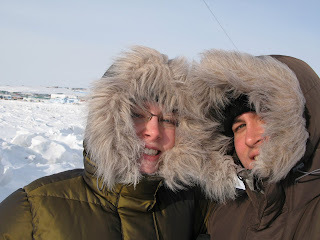 On Monday, Julia was supposed to fly back to Vancouver but a blizzard descended and trapped her for an extra 2 days. 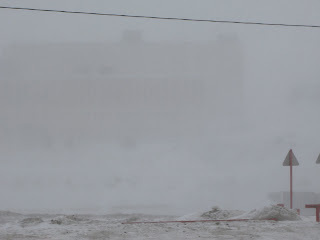 It's sort of fun to be inside in a blizzard when you can only see white out the window, although by the end of the second day we both had a bit of cabin fever. Overall I think Julia liked the trip up and hopefully it is helpful for us in deciding how much time to spend here over the next year. Here are some pictures from the last week. Enjoy! The beginning of the road, or the end?? 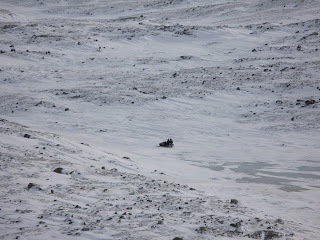 A ski-doo helps provide some perspective on the landscape. These pictures capture some of the vastness of this place. It is pretty amazing landscape to spend time in. Have you ever tried to read a doctors handwriting? It's an impossible task. A scrawling jumble of lower case letters often in a flourishing script, and written with fountain pen. Beautiful, flowing, and containing no decipherable information, the doctors note is a centre piece of medical record keeping. HTN and DMII are on the rise, and right behind them are epidemics of CAD and CVD. People are still smoking (some as much as 3 PPD) and still getting COPD. RAD is more common than ever before. It all makes sorting out those patients in the ED with CP or SOB very difficult! What's their PEF? Have they even had PFT's? Can you see their JVP? Can we get a CK and an ECG, oh and a BS (people always forget to check that! ), and better start an IV. If you do have CVD you might be at risk for a CVA, and if you have any symptoms of a TIA you should go to the hospital because that can be the first warning. Hope you remembered to take your ECASA! Well, unless you have an SAH, then it might complicate things. If we can't figure out the situation we'll have to arrange an MRI or a CT, and probably do an LP (ow!). If you start to get worse and your LOC declines, don't worry, we're all ready for RSI. Did we consider all of the possibilities? What about DKA? Does this patient have IDDM? (Hope we checked that BS.) Better to be safe than sorry, let's do an ABG, and put in an IJ. If your kidneys aren't working well we'll have to check your CRE. Do you take an ACEi or an ARB? It's sometimes hard to sort out ARF from CRF, but if you are looking sick I might assume you have ATN (until we figure it all out). Then again, maybe it's something chronic, like SLE or one of the other CTD's. Were you ever diagnosed with JRA as a child? If you do have ESRD you might have to go on PD (but I'm not saying you have a PD!). With so many diseases it's no wonder so many people have MDE! It's a known fact that it occurs more frequently in CHF patients. Still, better be careful and take a good history, it's easy to confuse with BAD, GAD or SAD. Pregnant women are getting PIH and PPH these days. If a new baby is breathing too quickly I always hope it's just TTN and not CHD! If you come to the hospital with too many of these acronyms attached we'll have to have a discussion about DNR, in case you need CPR, or end up in the ICU. It's all enough to make your head spin. How is an RN or an MD to keep it all straight? Sigh....It'll be okay, for now I'll just write down NYD. 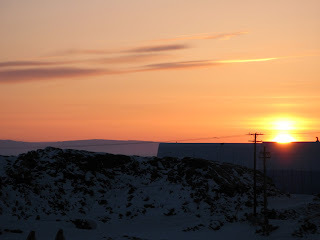 This past weekend I was on call for obstetrics at the hospital here in Iqaluit. Obs here in Iqaluit is very different than in more southern hospitals. For one thing the C-section rate is very low (I think less than 5%). In fact on the whole the rate of intervention of any kind is very low, with probably about 50% of women going through labour and delivery without even need for pain control. I am sure there are a lot of reasons for this, lower risk births to begin with (the riskiest people get shipped out), younger mothers on average than down south, lower percentage of primigravid (ie. first time births) women. Whatever the reasons, it makes for an enjoyable obs practice. I really enjoy obstetrics, but being on call for 3 days in a row can be a bit tiring. It was a pretty busy weekend, and I didn't manage to get much sleep. Today was my post call day, and I planned to sleep in really late. Well, apparently my body didn't agree to the plan...it was a beautiful, bright and sunny morning, and I woke up with the sun, feeling pretty good and so I didn't go back to sleep. Having an unscheduled day is nice, and I took the opportunity to wander around the city for a couple of hours. 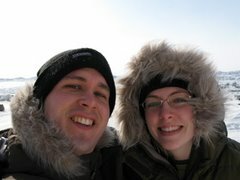 It's still -30C here so it's a little cold for strolling, but it was nice to get out in the sunshine. Here are some pictures I snapped along the way. Enjoy! 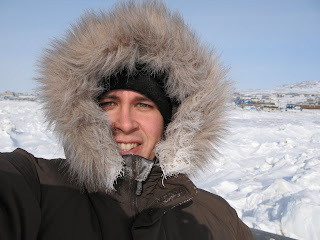 My parka is nice and toasty warm! This burned up rubble used to be a resturant called "The Snack Shack". 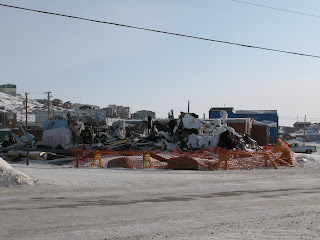 It was a beloved greasy spoon here in Iqaluit, that was open 24 hours a day, and delivered. At present there isn't any 4AM poutine delivery available here in Iqaluit, and everyones cholesterol has improved dramatically. 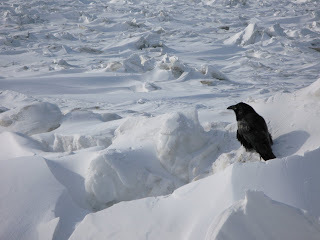 Here is one of the huge ravens that live up here year round. They seem to not mind the cold at all, and are huge!! 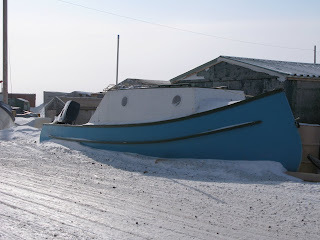 This boat is a little frozen in to go anywhere quickly. Here is the First Air plane from Ottawa coming in for a landing. The sky was a great colour, and I managed to snap a quick picture before the sun set. Enjoy. Yesterday, during a busy day in the emergency room, one of the nurses asked me "How come you're not getting stressed out?". I thought about it for a minute and replied "I used to get stressed out, but I was the only one who seemed to notice, so I gave it up.". I think she thought it was a funny idea, giving up getting stressed out, but I was serious. I remember when I first started working on my own as a doctor, and how I would get stressed out if the clinic was super busy and running late. The only problem was that it didn't seem to make the day any better, so I gave it up. These days I realize that stressing about what is beyond my control is not only a waste of energy, it's unhealthy. So, I avoid stress until I need stress. Stress is a clever adaptive response. The idea is that faced with a terrible situation your body has a mechanism to get really ramped up really quickly so you can fly into action. I like to think of it as an adaptive response to fighting bears, when a bear lumbers out of the woods in front of you, your body acts to give you the best chance of survival. Some people call it a fight or flight response (as in should I run or should I fight the bear), it's more scientific name is a sympathetic response (as in I have sympathy for those people who have to take on these bears). Your adrenaline rushes, your pupils dilate, your heart rate increases, your body redistributes blood flow, all of this to help us react quickly and effectively in order to survive. As an adaptive response to bear attack stress is very effective. In medicine, the bear is a difficult airway, or a profusely bleeding patient, or someone in cardiac arrest. In these situations a stress response is useful and called for. It speeds up your body, focuses your mind, allows you to act without regard for personal discomfort. A stress response to a real bear can be lifesaving. What is not a bear in medicine is an overcrowded emergency room, a grumpy colleague, or a poorly run clinic. These are the false bears of medicine, the teddy bears if you will. If you allow yourself to be convinced that they call for a stress response, you have been fooled. In these situations the stress response in maladaptive, because it does not affect outcome of the situation. Prolonged stress responses are unhealthy. They modify how your mind and body function in very real ways. For instance, a stress response diverts blood flow away from your digestive tract in favour of vital organs and muscle, disrupts sugar metabolism in the body, and changes the way we focus on multiple versus single tasks (all useful for bear fighting, not useful on a prolonged basis). On an ongoing basis, in response to pretend bears, these responses make you feel sick. When I am having a crazy day, when the patients are waiting to long, when everyone is grouchy, when one more person says 'How long do I have to wait?!?' when I am already going as fast as I can I think to myself this is not a bear, and I save my adrenaline in case I a real bear is hiding in the next exam room. Roll up the rim, Iqaluit style! 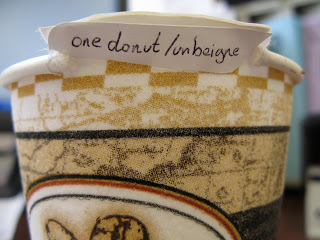 Okay, I admit it, this is not an official roll up the rim winner. I too have miserable rim rolling karma, having won a measly muffin in the past 2 seasons of roll up the rim. I like to think of them as seasons. Last season my record was 1-22-1. You might ask how I got a tie...well I actually won a muffin and a coffee last season, but I won the coffee on the last day of rolling and failed to redeem it, so I am considering that a tie. It's hard being such a chronically underachieving team in rim rolling, but I am used to it, and a lifetime of Leaf's fandom (Yes it is Leaf's not Leaves for you snarky Vancouver fans....the Vancouver team is the Giant's right?) has prepared me well for the trials and tribulations of difficult seasons. 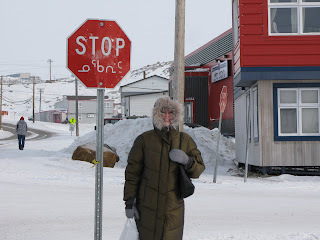 This season my team is sitting out since I am in Iqaluit, and don't have access to a Tim's. I'll be watching Julia's rim rolling team carefully and am hoping for big things. 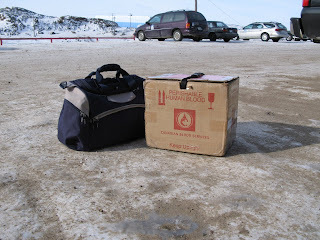 I'll also mention that if my cup win, pictured above, was legitimate it would be a hot commodity here in Iqaluit. Tim Horton's is like gold here, and it is common to see people on the flight from Ottawa bringing home dozens of donuts. 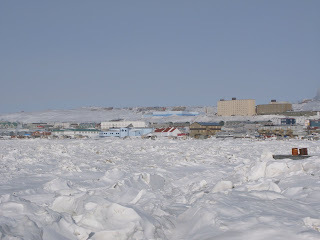 I think a franchise here in Iqaluit would be a logical next step for a new capital city. In the mean time I'll have to keep on drinking cafeteria coffee, working out my rim rolling fingers and getting ready for next season. 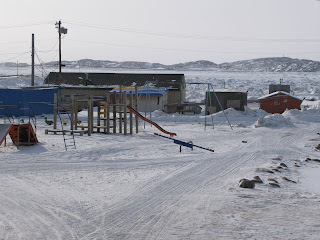 One of the biggest challenges here in Iqaluit is the medicine you do over the phone. Like most northern hospitals, Baffin Regional Hospital takes care of patients from a number of small communities in the area. In our case the 'area' is the eastern arctic, including about a dozen smaller communities, mainly to the north of us. Some of the communities are close (1 hour by air) and some are far. 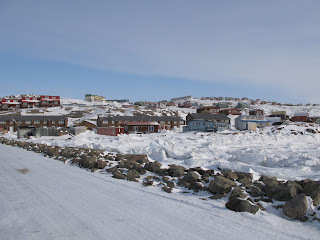 Griese Fjord, the most northern community we care for (and the most northerly permanently inhabited community in Canada) is about 12 hours round trip by air. Each community has a nursing station staffed by a few brave nurses. When things get beyond their comfort level, they call us for advice and sometimes patient evacuation. 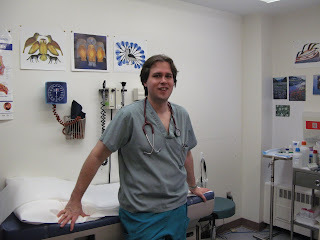 As a doctor, when I am on call in the emergency room I also field calls from all of the communities for emergencies. Medical advice, given over the phone, is always a risky proposition. I can't see the patient, can't examine the patient, and often (because of language barriers) can't even speak directly to the patient. I have to rely on the nurses assessment and description of the patient in order to make my decisions. Most of the nurses are experienced northern nurses, and they are excellent. With staffing shortages there is the occasional less experienced nurse, or new graduate and it can be hard to tell the difference. Sometimes the nurses are from Quebec, and even though they are likely excellent they mainly speak french. What does this all add up to? Not infrequently I find myself on the phone, discussing a medical situation in English with a nurse who's first language is french, who spoke to a patient who only speaks Inuktitut through an interpreter, and they are up to 6 hours away, and if I am not familiar with the nurse I often don't really know their skill level (though most are very highly skilled). As you can see there is lots of room for medical errors to occur. The CMPA, who provide medical malpractice insurance to all physicians in Canada, recommend that physicians avoid providing medical care by telephone, because it is fraught with medico-legal risk. With so much potential for medical error they recommend seeing the patient in person whenever possible. Obviously that is not geographically possible in Nunavut, so we are left with the alternative of doing what we can with what we have...the telephone. The main decision made in most telephone calls is whether to MedEvac the patient or not. This decision is based on lots of factors: how sick are they, how sick have they been before, is the diagnosis clear, what type of illness are we looking at, is treatment available at the nursing station, how young or old are they...the list goes on and on. What it comes down to is a judgement call: Do I need to see this patient or not? MedEvacs are costly. 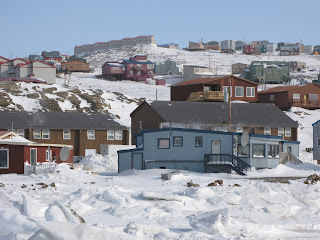 I am told that the average price for a MedEvac within the territory of Nunavut is $15,000 and the average for an evacuation from Iqaluit on to Ottawa is $30,000. There are only 30,000 people in Nunavut, so on a per capita basis those costs really add up. MedEvacs themselves are not without risks. 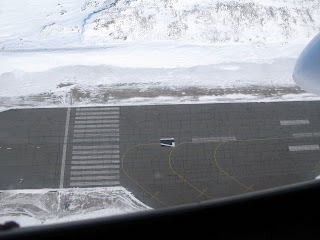 When I was a resident and working in northern Ontario I met an air ambulance crew who had MedEvaced a patient in marginal weather and had their landing gear get stuck up. They all called their families on the satellite phone to say goodbye, dumped fuel and belly landed the plane they were in. Luckily they all survived, but it always reminds me that calling a MedEvac incurs risk to the patient and flight crew, especially if the weather is bad. Every night on call my pager goes off and I talk to a nurse in a community hours away by air. It's late at night and they have a sick patient. Maybe it's an elder, maybe a baby, or maybe someone got in a ski-doo accident. They've done everything they can and need some advice. On my end I try to get a feel for the patient, for how sick they really are. I try to gauge the experience level of the nurse I am speaking with. Sometimes I get them to email me a picture of the patient, sometimes I try to speak to the patient directly. I look out the window and check the weather and think about putting the air crew at risk. I get all the information I can and make a judgement call, the $30,000 question. Today I got up at 6 AM to go the hospital for teaching rounds at 7. Considering the fact that I left the hospital last night at 11 PM and only got to sleep after midnight, I was not delighted to have to get up and go back just for teaching rounds. However, I made myself wake up, get dressed, and drive to Women's. I bought a coffee and showed up early to the teaching room. And no one else was there. It was cancelled. Needless to say, me=unimpressed. However, the upside of all of this is that my losing streak is over. It's been 2 years since I fought Tim and won. Eat your heart out, Mr. Donut. 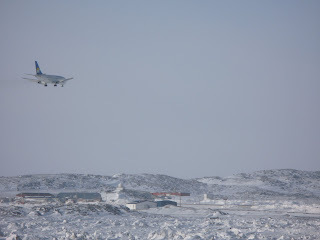 Here is a video of the landing in Iqaluit. Unfortunately it is poor quality as I set my camera on compact mode. You still get a bit of an idea of how many houses there are in the place as we fly by, although it is all a bit blurry! Family doctors seem to be at the centre of a lot of attention these days. Patients want to have one, towns and cities are on the look out for a few more, hospitals covet them. Where ever you look people are after family doctors. Although family doctors make up about half of physicians in Canada there is clearly a shortage, as I discussed in this post. When someone I meet finds out I'm a real live doctor, the next question is usually about if I am taking on new patients. As a practicing family doctor I could phone any town or city in Canada and have a job within an hour. It's nice to be coveted, but at the same time I think it signifies trouble with the system. Some of the questions it raises are logistical, and some are on the nature of family medicine itself. As I've already discussed some of the logistical challenges around issues of physician supply, I'll focus on the interesting question of what family medicine is really all about. I went into family medicine with the idea that it was a job that would allow me to do a bunch of different things. Since I was not keen on the idea of doing the same thing day after day it seemed a good fit. It turns out that family medicine is indeed a job where you can do an almost endless variety of things, but I think that definition misses the essence of the thing. At my medical school (Queen's), and probably in most others as well, family medicine was described as a job where you would manage a wide variety of diseases, in a wide variety of ways over the course of a patients lifetime. The emphasis was on the continuity of the encounter, over a patient's lifetime, as the defining factor in family medicine. I hesitate to criticize these definitions, because they do describe in part what a family doctor does. What they don't do is describe what a family doctor is. In fact in my 4 years of medical school and 2 years of residency training discussions of what family doctors did rarely went beyond the party line of 'managing a wide variety of diseases, with emphasis on chronic diseases, in continuity and over the patient's lifetime'. What I think is lacking in these definitions is the whole point of family medicine. I would argue that as a family doctor I manage and care for people (who happen to have diseases) rather than diseases themselves. Although that may seem cliche and vague, I'll illustrate how it is an important distinction as well as where I think the distinction comes from and what impact it has on patient care. The notion of what it means to be a good doctor has changed over time in both the minds of the public as well as in the minds of physicians. Here is a picture of the most revered of Canadian (or maybe American or British depending on where you hail from) physicians, Sir William Olser. As usual we see Osler at the bedside, because in his time a good doctor was one who comforted the patient, at the bedside. This was part of the notion of what being a good doctor was all about. Interestingly, what he is doing in the picture (playing with dolls) has nothing at all to do with our modern notion of medicine, but clearly has a great deal to do with making this sick little girl feel better. So how could a busy, famous, doctor like Sir William find the time to play with dolls with one of his sick patients? Couldn't his time have been better spent finding some other sick people to cure? Of course the reality of his time was that cure was rare. Of course this is a man whose stated goal was “cure rarely, relieve suffering often, and comfort always”. In this picture he is comforting the patient, and therefore relieving suffering. We are left guessing when it comes to the cure. In Sir Williams mind what he is doing (again, playing with dolls) is medicine, by virtue of effect. In fact the idea of suffering has been much lost within medicine. For most doctors suffering equates with pain, and while pain certainly is a cause of suffering the two are not the same. Indeed, suffering has many causes that go far beyond pain. In his excellent book "The Nature of Suffering and the Goals of Medicine" Eric Cassell discusses many of these ideas. Suffering, he states, is caused by threat to the integrity of personhood. What threatens anyone's integrity is a deeply personal matter, yet in order to relieve suffering it is a matter which begs to be understood. The rise of technology driven medicine has also created the rise of the physician-scientist. The ideal modern physician is not a hand-holder like Sir William, but instead is part time clinician, part time scientist. Busy and important, active in research, this perfect physician is as concerned with discovering the next, best-thing, as with care of the patient at hand. This new ideal-physician didn't sit easily with family doctors (or GPs) as with less specialized knowledge, less technology, and often not involved in research, they clearly failed to hold their heads above the waterline of the new ideal. And thus a new inferiority complex was born. Family doctors have responded by increasing their science, adding evidence, and participation in clinical trials to their practice, and by endlessly discussing where the expertise and specialization of family doctors really is. Of course there has been a cost to the process, and unfortunately it is not a cost paid by the physicians themselves. In fact the cost has been paid by patients. When family doctors choose to prove their science (and thus deny inferiority), they all too often do so at the expense of comfort and relief of suffering for their patients. The nature of what specialist physicians and family physicians do is very different. Specialists provide specific answers to (hopefully) specific questions. They focus on a specific problem and a specific system, and as a result often see the patient in the context of that disease. This seems not only rational based on the mode of practice they engage in, but probably facilitates patient care. Family doctors, on the other hand, see that patient first and the disease second. By knowing the patient as a person, a family doctor is well positioned to determine if an event, an injury or a disease is causing suffering to that particular patient, and to relieve that suffering, sometimes without curing the disease. Family doctors need to be well trained and excellent at making diagnoses. They need to keep abreast of science and research and incorporate it into their practice. Some family doctors need to participate in research themselves to advance family medicine as a science. However, all of that should occur within the context of treating patients as individual people rather than as diseases. The inferiority complex carried around by many family doctors has caused great harm to the profession. It has shifted focus away from where it belongs, and made family medicine an unpopular career choice. When we can say again that family medicine is a profession about offering excellent care, curing when possible and relieving suffering often I suspect family medicine will feel like a more rewarding job, and will be a more attractive career choice. Dr J: What brings you in today? Translator: She says things at home are hard. She doesn't have her strength anymore, and her husband is sicker than he used to be. Translator: She says to tell you thank you, you are a good doctor, thank you for listening, she feels better now. I left the room totally perplexed with no idea of what had gone on. I felt I had done nothing at all to help this lady, and yet I got a hug and lots of thanks out of the encounter. In reflection I think this encounter was mainly about this patients suffering with her loss of Independence, and the fact she had no one to talk to about it. I think she was comforted by talking to me (in spite of the fact that I understood little of the conversation, and most of the conversation was untranslated), and felt better as a result. In fact 'doing nothing' is really the medical term for 'not curing'. I didn't cure this patient, but I did help her to feel better and that seems a good goal to me. To me, that is what taking care of people is all about.